Originally from American Fork Utah, Amy received her training at Jacqueline's School of Ballet under the direction of Jacqueline Colledge, Brittnee Squires and Heather Gray. Amy was accepted as a member of URB II in 2009. She attended Regional Dance America where she was chosen as an Honor Student each year from 2013-2016. While at RDA she was awarded scholarships to summer intensive programs at Houston Ballet, American Ballet Theater, and Utah Regional Ballet as well as RDA National Choreography Intensive. Amy has competed and placed in the top 12 at Youth America Grand Prix each year from 2013-2016. In the Summer of 2015, Amy toured Europe with URB 2, performing as part of the Young Tanzommer Festival in Austria. 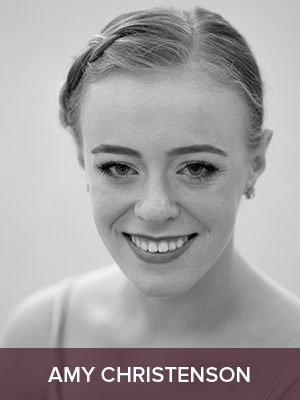 Amy was invited to train with Utah Regional Ballet’s professional company in 2014 and became a full company member under the direction of Artistic Director Jacqueline Colledge in August 2016. Some of her favorite roles include: Dark Angel in George Balanchine’s Serenade, featured soloist in Alan Hineline’s Funf, as well as Woodnymph Soloist, Arabian Soloist, Spanish Soloist, and Waltz of the Flowers Soloist in Nutcracker. Amy attends Utah Valley University on a full tuition scholarship and is pursuing a Bachelor of Arts in Dance with an emphasis in Ballet. Amy is very excited to be a part of Utah Regional Ballet!